The Government annouced yesterday that is to provide a €5,000 grant to incentivise the public to purchase electric cars, when they go on general sale next year. Energy Minister Eamon Ryan said the grant would make electric vehicles comparable in price to conventional cars, but they would run at 20% of the cost. The Government wants Ireland to become an effective test site for electric cars, with an optimistic goal of 10% of all vehicles running on electricity by 2020. Last year, the Government signed a strategic deal with Nissan Renault, and today Renault is showcasing its new electric vehicle, the Fluence. 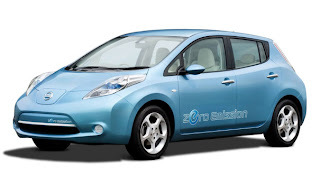 The first registered electric car arrived in Ireland yesterday - a Nissan Leaf (pictured above). However, there is some controversy over the scheme, particularly with the new cars having a maximum range of 160km. In terms of charging facilities, the ESB has already committed to installing 1,500 charging points across the country before the end of next year. For more information on this story click here to visit the Silicon Republic website or here to visit Motricity, the Irish electric car news blog.